Attention customers living in California and Vermont! Starting Friday, new CA/VT compliance laws go into affect in these states that reduce the amount of lead allowed in faucets and fixtures that carry drinking water. Allowable levels will drop from 8% lead per weight to .25% lead per weight, and only kitchen faucets and bathroom lavatory faucets are impacted at this time. Shower faucets and other fixtures are not affected. Because there is no safe level of lead in drinking water, CA/VT compliance laws further reduce the risk of lead exposure. Lead leaching into drinking water can lead to a number of conditions such as delayed development in children and high blood pressure in adults. The new CA/VT law means customers who live in either California or Vermont can only order faucets and fixtures from eFaucets.com that meet the new compliance. It is against the law for eFaucets.com or any company to sell or ship faucets and fixtures to California and Vermont that are not CA/VT compliant. To make sure shopping at eFaucets.com remains the easy process customers expect, each product that meets CA/VT compliance will be marked with a black checkmark icon. eFaucets.com has made help easy to find by clicking here. Do I have to purchase the CA/VT substitute? The new laws state that residents are not allowed to install faucets and fixtures that do not meet CA/VT compliance. Most manufacturers have two versions of their products, and, yes, they might a little more expensive given the increased costs of manufacturing and added brass materials. By not using or installing CA/VT compliant faucets and fixtures, residents in California and Vermont risk running afoul of state building codes, which can affect building and plumbing permits and passing inspection. Could Lead Get Into My Drinking Water? Lead gets into water after the water leaves the local treatment plant or well and is typically caused by pipe or soldering corrision in your home's plumbing. Corrosion results from the reaction between water and the plumbing parts. Dissolved oxygen, low pH (acidity), and low mineral content in water are common causes of corrosion. Grounding utility wires - electric and telephone, most commonly - to water pipes can increase corrosion from the electric current running through the pipes. Eliminating the lead content in home plumbing is an effective control of lead in drinking or cooking water. Professionals are also affected since plumbing fixtures, including pipes, joints, and fittings need to meet CA/VT compliance as well. Several brands available through eFaucets.com such as Delta Faucets, Danze Faucets, and Moen Faucets are already working to redesign faucets and fixtures to meet CA/VT compliance. They anticipate other states will follow the CA/VT example and the new regulations will become industry standard. As always, eFaucets.com representatives are available via live chat, email, and phone to answer any questions. Traffic jams should only happen on the roadway and not in your bathroom. But according to the 'Bathroom Inventory' survey conducted by Moen Faucets, the reality is that more than half of master bathrooms are less than 75 square-feet. Small bathrooms force most couples to make do with limited space. With that said, there are ways to reduce the congestion in this crowded room according to Tim Bitterman, Senior Product Manager of the Inspirations by Moen line of bath accessories. "Careful design, dedicated space for each individual and a willingness to compromise can make even the smallest room feel more spacious." Small spaces require organization. Too many toiletries, cleaning products and hair dryers can make a small space feel smaller. Clear off the sink, clean out the medicine cabinet and remove products from under the sink. Take stock of what you own and what you use on a daily basis. Pare down the excess and keep only what you need. Baskets and bins will provide order to the items you plan on keeping. "It's all about creating more room and carving out your own space," explained Bitterman. One such example is installing a glass shelf. "This easy project is perfect for the DIYer, doesn't take up counter space and gives both of you more room to store smaller toiletry items as well as keep them easily accessible." Mirrors have the ability to visually double the size of your bathroom. By reflecting natural light, they can give your bathroom the appearance of being more open and bright. Full sink to ceiling mirrors create the most significant illusion of increased space. But if that isn't an option, consider a single mirror in a unique shape to create a point of visual interest. Two sinks can make sharing a bath much easier - provided you have the space. Many newer vanities can accommodate two sinks. You'll need to allow at least five feet when adding a vanity for double sinks. No room? Consider side-by-side, small pedestal sinks instead. No budget for new sinks? Change your faucet with one of today's newer high arc styles. The longer neck and spout of these faucets make it easier for both of you to have the room to brush your teeth, wash your face or even shave - at the same time. A dark room feels cramped and crowded, while natural light can make the bath feel open and larger. Add sheer blinds or apply a film treatment to your window to let in more light, while still allowing for privacy. Consider changing the lighting fixtures as well. Overhead lighting tends to add unflattering shadows to your face while looking in the mirror. Try installing wall sconces level to the top of the mirror. This puts the light in front of you, creating the most optimal lighting for grooming. Consider installing two double robe hooks for items such as robes, pajamas and towels. Keeping robes and towels off the floor reduces the cluttered appearance of a small bathroom. Bitterman suggests double towel bars, as well. "If each of you has your own designated towel bar, you'll have ample room to hang washcloths, hand towels and bath towels." Transform your shower into a spa experience with a massaging showerhead with multiple spray settings. This will allow you to choose and personalize your settings. Choose a vigorous massage for him and a soothing rainshower for you. Most importantly, according to Bitterman, "Don't impose your decorating styles and tastes on your mate. Talk about color selections and look at wallpapers and paints together. By incorporating colors you both like, it's possible to create a room that brings the best of both worlds together, creating a retreat that can become the calm in your morning storm." 'Tis the season... for Thanksgiving turkey, Christmas eggnog, mistletoe... and your holiday guests. While many homeowners will deck the halls with festive decorations or make minor home repairs, most will concentrate on traditional areas such as dining, family and living rooms where guests will be entertained. However, homeowners usually overlook the one room where holiday guests frequent most - the powder room or bathroom. "The powder room is one of the most frequented and least appreciated rooms in our homes when it comes to decorating," said Judy Riley, vice president of design, Moen. "And because the size of the powder room is typically smaller than other rooms in your home, it gives you the opportunity to be more creative with your décor choices - allowing you to tap into the warmth of family traditions and nostalgia of the holiday season." One of the quickest, easiest and most inexpensive ways to update your bathroom's style is to replace or add bath accessories. For a small investment, you can add a complete set of new accessories - including towel bars, towel rings, shelves, paper holders and robe hooks. Accessories can add organization, while pulling the design of the room together. We recommend Creative Specialties by Moen. "Many people will add soaps and candles, or new towels in their bath at the holidays," added Riley. "Why not complete the look by updating the bath accessories as well? A decorative glass shelf can be the perfect area to display candles, and a beautifully designed towel bar will make your linens stand out." In the past, chrome or polished brass were the only finish choices in the bath accessory marketplace. Fortunately, the industry has changed dramatically, and manufacturers now offer dozens of finish and style options. While chrome is still the most popular bath accessory finish, emerging finishes, such as oil-rubbed bronze, antique bronze, brushed nickel, brushed bronze and wrought iron are also increasing in popularity with consumers. In addition to elegant styling, Creative Specialties by Moen collection can be installed in a matter of minutes - which is important during the hustle and bustle of the holiday season. Thanks to Moen's EZ 2 Install Mounting System, installation is a snap. A mounting bracket attaches to the wall with just two screws. Then the base, or post, of the accessory slides onto the bracket and an audible "click" signals it is securely locked into place. Most importantly, it eliminates the need for a set screw, the number one complaint from consumers who have installed their own accessories. If you want to go take your bath updates one step further, consider adding a new single-handle faucet that will give your bath a clean and modern look. The Eva® single-handle lavatory faucet from Moen Faucets offers transitional styling - with understated details, a tapered handle and sophisticated lines - that coordinates with virtually any décor. As for final words of advice, Riley added, "The powder room isn't first on the list when we think of entertaining, but it can leave a lasting impression with guests. Continue your holiday spruce-ups into the bath and you'll be surprised at the compliments you receive." 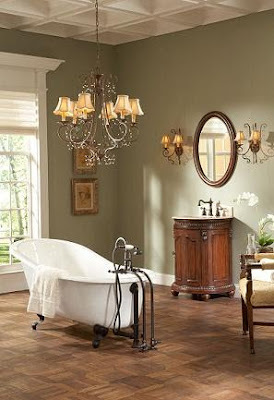 If you are looking to upgrade your bathroom with Rich Vintage Style then we would like to introduce you to the World Imports Plumbing line of designer faucets, clawfoot tubs and rich bath vanities. The Belle Foret collection includes a full range of kitchen and bath faucets, copper basins, and bath vanities in fashionable finishes to perfectly complement almost any decor. True to the French Country design, these distinctively elegant faucets and fixtures are graced by the rich patina of time - without the wait or expense. Discover the Belle Foret Collection. A voyage well worth taking. Belle Foret Faucets and Belle Foret Vanities are some of the most popular products sold online especially on the east coast. The fixtures in the photo top right are as follows. Single Basin Vanity BF80069R, Mirror BF80070, Bathroom Faucet BFN36001ORB, Dual Tub ECUSADP, and Tub Faucet ECRM01ORB. With the Elizabethan Classics collection you'll find everything you need to complete the bath of your dreams. Classic cast iron clawfoot tubs, acrylic clawfoot tubs, bath faucets, Victorian-style water closets, pedastal lavatories and console lavatories - all inspired by the days when style was warm, comfortable and appealing with just a flourish of understated sophistication. This elegant collection perfectly captures the charm of the past - a more relaxed, slower-paced, romantic time. Elizabethan Classics collection is as timeless in design as it is sound in function. Indulge yourself in the best of both worlds - beauty and luxury, with the convenience of modern day innovation. Just imagine the warm comfort of a Slipper bath as you lie back and soak away your worries. This timeless classic is as cozy as it is graceful and enduringly beautiful. The bathroom collection to the right is made up of the Slipper Tub ECSBORB, Tub Faucet ECTW04oRB, Single Basin Vanity BF80020R, Mirror BF80021, and Bathroom Faucet BFN300 01 ORB. The Lighting in the collection is from World Imports Lighting. Indulge yourself to the delight of your senses in the generously sized Double Slipper Tub. Exquisite curves and dramatic Lion Paw feet are just the prelude to this tub's real enticement - its ample bathing well. Sit back and relax in a traditional slipper tub which is sure to release your tensions and help you wind down at the end of the day. The toilet is the English Turn Toilet ECETELWH Double Basin Vanity BF80046R, Bathroom Faucet BFN300 01 ORB, Double Slipper Tub ECDSLORB, Tub Faucet ECTW33 ORB, Bath Lighting BF8382-88 and Mirrors BF80047. Find the entire collection of Elizabethan Classics Tubs, Elizabethan Tub Faucets, as well as Belle Foret Faucets and Vanities at eFaucets.com, the online leader in Faucets, Sinks, Fixtures and Accessories for the Vintage Bath. Is your kitchen far outdated and stuck in a 60's, 70's or 80's decor? Do you think you have to spend a lot and perform a massive remodel to get it into this century? Think twice! All it takes is a few easy upgrades to quickly bring your kitchen into the times. The kitchen used to be about function. Now it is the center of the house and the gathering area for guests. Since it sets the theme for your home it needs some style especially for when guests come over. For remodeling or updating on a shoe-string budget, there are a number of alternatives to improve your kitchen. Add finishing touches to your cabinetry selection with distinctive decorative hardware and under-counter lights, all of which add ambiance to the room. Additionally, you have the option to refinish you existing cabinetry. You can mix and match shades. Current trends in finishes lean toward darker stains and glazes on cherry and maple woods. A top priority on consumers’ kitchen upgrade wish lists is often a more expensive countertop material, such as granite. Granite offers the benefit of minimal maintenance and will retain its good looks for years to come. It is the most durable and least porous of all stones and offers a rich look in the kitchen. Because remodeling with granite for all countertop surfaces can be costly, experts advise that mixing and matching materials is becoming popular. Consider installing a granite island for more countertop space and to serve as a focal point or refinish your existing island in granite. Updating kitchen faucets is a simple kitchen upgrade, adding a sense of style to the kitchen. With so many finish options, a great decorative faucet can be the centerpiece of the kitchen. New designs incorporate functionality and elegance. Take the new Aberdeen™ kitchen faucet from Moen Faucets which features a classic style, but with surprisingly nimble functionality. Aberdeen faucets feature a high arc, pull-down spout with a one-of-a-kind pause button that allows the user to conveniently interrupt water flow. 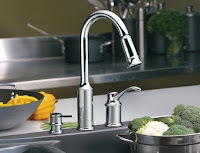 Available at eFaucets.com, the Aberdeen faucet will give your kitchen an added dose of style and sustainability. eFaucets is the online leader for Moen Kitchen Faucets. Just installing one or two new appliances can update your kitchen’s appearance. Stainless steel continues to be the rage when it comes to the look in kitchen appliances. Stainless offers a neutral, sleek image with a commercial feel – it is available in all price points for remodelers who need to stick to a budget. But if stainless isn’t your style, manufacturers are coming out with new looks that infuse color into the room, including sunburst yellow, candy apple red, robin’s egg blue and mint green. For those hesitant to use bold colors on large appliances, a splash of color can be added with one of the many small hand appliances now available in these bright colors. Nothing livens a kitchen like new lighting fixtures. Consider using miniature, low-voltage pendant lighting for an island counter. For accent lighting, try a decorative pendant lamp over your kitchen table with a dimmer switch to set the mood for special occasions. Lighting fixtures are available in many different styles to match your taste in style and décor. You can find fixtures in all price points at home centers, hardware stores and kitchen showrooms. Many homeowners today are making a statement with cobalt blues, oranges, reds and greens in the kitchen. These colors are finding their way onto kitchen walls through new faux finish designs, including sponging techniques and stencils that personalize a look. In many cases, white has been relegated to a smaller role as accent or trim. Your kitchen can be further personalized by using borders, wallpaper or tiles. Use decorative, hand-painted tiles for trim and backsplash areas and ceramic, porcelain or quarry tile for main countertop areas to create a distinctive or highly personalized look. Another popular flooring option is ceramic tile. Today’s tiles mimic real stone, but have the benefits of lower cost and easier installation. Available in every shade of the rainbow, tile is a great way to upgrade your kitchen. Design experts report that neutral colors and European styles in ceramic tile are what everyone is looking for. So bring that kitchen of yours into the 21st Century. Maybe it’s not a complete overhaul this time, as just a couple of these upgrades can significantly give you and your family that ‘new kitchen’ feeling. Kohler and Designer Erin Valencich give advice on what to look for when choosing a kitchen faucet, including spout type, handles and finish. When you plan a new kitchen you have a lot of things to think about. Appliance, countertops, cabinetry, but don't forget the Kitchen Faucet. It can make a big difference to the rooms look and function. First you need to make sure you match the right faucet to the right task at hand. For example, a lot of time in the kitchen is spent on clean up and that is where a faucet with a pull down spray works exceptionally well. Watch the video to see how easy it is to manuever. These days there is a kitchen faucet available for about every kitchen task imaginable. When you are cleaning and cooking with large pots vessels or vases then a kitchen faucet with extra height can come in really handy. Also, pot filler faucets are really convenient to have near your cook top because they eliminate the need to lug heavy pots of water around the kitchen. 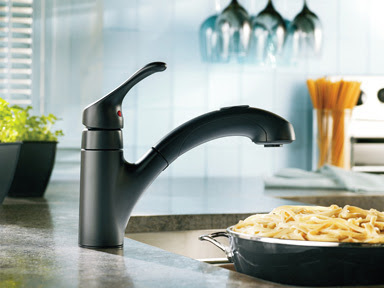 Touchless filitration faucets are great for running the water when your hands are messy and they help germs from spreading throughout the kitchen. If you are looking at the ultimate in faucet innovation then you really cant beat the new Kohler Karbon Faucet. It lets you direct the spray precisely where you want it and it folds up tight when you are not using it. What a totally cool look from Kohler. We believe Kohler Faucets are the ultimate choice for style and innovation. When you are choosing a faucet, there a few things to think about. First, the size of your faucet should match the size of your sink. For example, you want to make sure the faucet spout has enough reach to cover the entire sink, especially if you have double basins. If you are thinking about adding an ultra convenient entertainment sink, like maybe to your kitchen island, you will want to pair it with a more petite faucet. Next, you will want to think about how many handles you will want. Keep in mind that two lever type handles are best for anyone with mobility issues for their hands or fingers. If you always have your hands full in the kitchen, you may want to consider a single handle faucet. These are simple to operate with just one hand. You will also need to think about installation. Different type of faucets need (1) one to (3) three holes through the sink or counter. Other styles may be mounted through the wall. Some faucets come with a base or cover for unneeded holes. Be sure your sink and faucet work together. One of the fun things about choosing a faucet is deciding what style you prefer. Luckily there is a design for every taste. From contemporary to traditional and everything in between. Another part of the style decision is choosing a faucet finish. Think of your sink, cabinet hardware and lighting for queues. Stainless Steel or brushed nickel faucets for example look great with a stainless steel sink. If you are looking for a warmer look, brushed bronze goes beautiful with wood. And of course there is classic chrome too. IntroductionThese instructions by Moen Faucets will help guide you on the installation of a Moen Kitchen Pull Out Faucet. To complete the project, you should first gather the tools and all the parts you will need. The basic steps to complete the project are to gather all tools and parts, turn off your water supply, prepare the mounting area, attach the hose to the faucet assembly, mount the faucet, connect the supply lines, and finally test and flush the completed assembly. Caution: Always turn water supply OFF before removing existing faucet. Caution: Turn faucet on to relieve water pressure and to insure water is completely off. Helpful Tip: Use a penetrating oil spray on the faucet mounting hardware to help loosen corrosion and assist in removing the existing faucet connections. Helpful Tip: Remove mounting hardware using a basin wrench or channel lock pliers. 1. Thoroughly clean and dry mounting area. 2. Attach the hose to the Pull-out Spout by placing the screen washer in the hose nut and attaching the hose to the pull-out spout. 3. With the spout receptor facing directly forward and threaded discharge tube in back, feed small end of hose down through spout receptor. When you feel resistance, feed the hose through with a push/pull motion. Set aside the faucet assembly. Depending on your sink configuration, you have the option to install your faucet with an escutcheon or a round deck ring. Never use the escutcheon and deck ring together on one sink. 4a. If you're using a 10" escutcheon, align the faucet assembly in the two slots on the escutcheon so that the discharge tube is in back. Then, install the faucet through the escutcheon deck plate and deck holes. Push the entire assembly toward the bank of the sink as far as possible and center the faucet on the sink. 4b. If you have a deck ring assembly, align the faucet assembly in the two slots on the deck ring. align the deck ring gasket and the deck ring on sink, and lower the faucet assembly into the sink. Then push the entire assembly toward the back of the sink as far as possible. 5a. If your deck is less than 1/8" thick, install the mounting bracket with the open side up by hooking it around the supply tubes and sliding it up and onto the threaded discharge tube. You may need to gently pull the supply tubes away from the discharge tube, but be careful that you do not kink the tubing. Install and slightly tighten the mounting nut with the included mounting tool. 5b. If your deck is more than 1/8" thick, install the mounting bracket with the open side down. Install and slightly tighten the mounting nut with the included mounting tool. 6. Rotate the spout receptor to the left and right, noting where it stops. Faucet should move to the left and right equally from the center. To readjust, loosen the medium mounting nut and move the spout receptor to the desired rotation. Hand tighten medium mounting nut. Check movement of the hose before finally tightening the nuts. If the hose does not move freely, gently bend the supply tubes out. Do not kink supply tubes. Tighten the mounting nut with the tool provided. Use heavy duty screwdriver through the hole in the bottom of the tool to tighten the faucet securely. Tighten small mounting nuts with an adjustable wrench. Re-check for alignment, and be sure that the faucet is centered properly on the sink and that it does not shift position when the spout is moved from side to side. 7. Assemble the sprayer hose to threaded discharge tube and tighten with an adjustable wrench. The counterweight is designed to snap together onto the spout hose. To disassemble the counterweight, depress tabs and pull halves apart, or pry halves apart with a flat-head screwdriver. Assemble counter weight at the bottom of the spout hose loop. Align tabs on each half of the counterweight with the slots on the other half of the counterweight. Squeeze halves together until they snap together. The counter weight should not slide on the hose. 7b. The pull out hose is attached to the underside of the faucet using the Hydrolock connector. The white clips on the connector need to be in the full open position. Slide the hose into the Hydrolock connector as far as possible then push in the white clip. There will be a distinctive "click" sound. Repeat the process when attaching the Hydrolock connector to the faucet. Be careful to join these fittings as straight as possible. 8. Connect your water supply line to one-half inch threaded fittings. Hold threaded fittings with wrench to prevent twisting and collapsing of copper tubing while tightening with another wrench. Gently move the supply tubes back to clear the path of the hose. Connecting your new Moen faucet to the existing flexible water supply lines will require using a wrench to snug up the connections. Some models will now include flexible supply lines. For these installations, remove the old flexible supply lines from the existing stop valves and attach the new lines directly to the valves. In either case, be careful not to over-tighten. Pipe chips, stones, and other solids found in new and renovated plumbing can damage the sealing surfaces of the cartridge and cause a leak. To avoid damage to your new faucet, do not turn on the supply valves until you have followed these flushing instructions. Pull hose out of spout receptor, tie a cloth around the hose to keep it from slipping back into the spout receptor. Unscrew the pull-out spout and remove the screen washer. Turn on supply valves. Direct hose into sink, then turn the faucet on in the full cold position to turn on the cold water supply for 15 to 20 seconds. Turn off the cold supply valve. Now turn to the hot position and turn on the hot water supply for another 15 to 20 seconds and then turn off the hot supply valve. Place handle in closed position. Reinstall the screen washer and pull-out spout. Turn on the hot and cold supply valves and test for leaks. 10. Unscrew the aerator from the end of the spout and clean the cone screen. Then replace the aerator and check the system for leaks. Your new Moen Faucet Trim Kit is now ready for normal use. Whether you're peeling veggies, filling a stock pot or just washing your hands, you spend more time at your kitchen sink than in any other area in your kitchen. So choosing a stainless steel sink isn't a decision you should make on a whim. Our featured manufacturer, Moen, offers a growing selection of quality stainless steel sinks in four distinct lines - Lancelot Professional®, Lancelot®, Camelot® and Excalibur®. All deliver exceptionally quiet service thanks to the state-of-the-art sound-deadening properties of our SoundShield undercoating. With more than 50 models to choose from in a broad range of shapes, sizes, and configurations, how do you decide which one is right for you? As you browse through this guide, envision your kitchen and the way you intend to use it. Look for featured sinks that match each type of kitchen shown, and consider the highlighted features for each design. Plus, check out the handy design tips found throughout the guide to ensure your sink choice works with your space and your budget. Visit our Moen Faucets and Moen Sinks brand pages to view the entire Moen Collection. From restaurant-grade appliances to custom cabinets, you want your kitchen to make a bold impression. Kitchens have expanded in the last few years and they have opened up to entertaining guests. That means style has become important since the kitchen is more visible to guests and that means kitchen sinks and faucets have upgrade to professional style or grade. When your kitchen has the capability to cater a party for 100 people, you need a sink with enough impact in size and style to command attention among the other industrial elements in your kitchen. A square sink is well-suited to the look of commercial appliances. In addition to offering a chic, international design element, a sink with zero-radius (angled) corners maximizes usable bowl area and makes it easier to clean. SoundSHIELD undercoating provides state-of-the-art sound-deadening for years of quiet performance. Tip: When placing your sink, the National Kitchen and Bath Association recommends at least 24" of countertop on one side of the sink and a minimum of 18" on the other. You love to cook, and you prepare nearly all of your meals at home. From fresh vegetable omelets to three-course dinners featuring roasted duck breast with orange glaze, your kitchen runs on a full-time basis - which makes for plenty of clean-up. Be sure to put durable construction and plenty of room for dishes high on your wish list. Look for at least one 10" deep bowl to accomodate large pots and pans. Heavier-gauge steel will provide long-lasting durability - the lower the number, the thicker the steel. Drain holes that are located closer to the rear of the sink maximize work space within the bowl. Tip: Combing an undermount sink with a high-arc faucet will make it even easier to access the sink and clean awkward items such as baking sheets. You want a kitchen that allows you to stay connected to what's happening in other rooms of your home as well as a place where people gather to share conversation. The kitchen is now becoming the gathering place for when guests first arrive at your house. Maybe it is where you start the night with appetizers and a glass of wine before moving into the living room or dining room. This open-access floor plan essentially turns your kitchen into another living room, so you'll want a sink that blends into your decor, and not one that distracts from it. For added convenience, consider adding a secondary sink to allow several people to work simultaneously. Or use your additional sink as a beverage center. Undermount sink installation provides a sleek, understated look that allows your countertops to shine. D-shaped bowls have a gently rounded shape that is easier to clean. Tip: Controlling sound is important when your kitchen is open to adjacent rooms. Moen SoundSHIELD coating will dampen noise caused by dishes and vibrations. If you don't have an abundance of square footage to work with in your kitchen, then it's important to make the room work as efficiently as possible. You have to maximize your space the best you can. When space is at a premium, even your choice of sink can help you keep things running smoothly with style. Think flexibility. Think in all dimensions. Size may be limited, but creative use of space is not is not limited. Extra mounting holes can accommodate useful accessories such as a soap dispenser or instant hot water tap. Attach your garbage disposal to a shallow bowl to maintain maximum storage space in the cabinet below. Tip: Keep in mind that a wide sink will reduce your available counter space. The National Kitchen and Bath Association recommends a linear total of 158" of countertop. You want your kitchen to look great, but you have to stretch your budget to cover everything on your wish list. With Moen Sinks, you won't have to sacrifice quality to get a stainless steel sink you'll love for years. Tip: Look for a longer spout reach when pairing your faucet to a multiple bowl sink. Better yet, consider a faucet that features a pullout so you can easily rinse out your sink. Determine the mounting options on your sink. Faucets are measured by the distance between mounting holes, center-to-center. Most two-handle kitchen faucets are 8-inch centers, while bar faucets are 4-inch centers. If you chose a single-hole mount faucet, extra holes can be covered by a deckplate or used for accessories such as a soap/lotion dispenser. Undermount sinks allow unlimited flexibility with faucet position. For Tips on cleaning and maintaining stainless steel kitchen sinks read our article titled 5 Tips for Maintaining Stainless Steel Sinks. Combine Art, Nature, and Architecture and you get Fluid Faucets. Each Fluid Faucet design makes a subtle connection to the influences of our environment. We call this collection the 8 Gotta Have It Bathroom Faucets. Why? Once you see the design elements in these bathroom faucets you will tell yourself that you have gotta have one of these faucets in your bathroom. Friends will be talking up a storm and asking you where you purchased such style. Imagine telling your friends that your bathroom faucet is the body of a Penguin, an Emperor, a Rainbow, a Toucan or Ancient Greek Ruins. Sublime reaches the highest levels of form and functionality. Designed with insight, Wisdom is an inspirational fixture complementing a wide spectrum of sensibilities. The rhythm of music is reflected in the flowing form of the Swing line of faucets. The vitality of the ancient Qin dynasty influences the sweeping form of the Emperor faucet line. ToucanLike its noble namesake, the Toucan line is versatile and distinctive— key elements to effective design. The design of the Jovian line is reminiscent of the enduring craftsmanship of the ancients. Once representing social status in ancient Asia, the fan series borrowsits graceful lines and motion from this history. Even though 70% of the earth's surface is covered by water, less than 1% is suitable for consumption. With the earth's population continuing to rise, it is critical that we get smarter about how we use our supply of potable water. The good news is that we all can make a difference just by making a few small changes to our daily habits. Turn off the faucet while brushing your teeth, and rinse out the sink when you're finished. Capture shower/bath water while waiting for water to change temperatures: This excess water can be used for watering plants. Don't wait for the water to get hot before filling the tub for a bath. Put in the plug and adjust the water temperature as the tub fills. Do not use the toilet as a garbage can: Only flush the toilet when disposing of sanitary waste. Turn off the water while shaving: Fill the bottom of the sink with a few inches of water to rinse your razor. The Water Saving Tips are brought to you by our Featured WaterSense manufacturer KOHLER. The EPA named KOHLER faucets as the 2009 EPA WaterSense Partner of the Year for their efforts in designing and producing faucets, toilets and showers to save water. KOHLER® Toilets that flush 1.28 gallons or less, when compared to a 3.5-gallon toilet, can save homeowners up to 16,500 gallons of water per fixture per year. ** Based on average usage of a household of four. 2. Use Water-Conserving Showerheads or HandshowersKOHLER 1.75 gpm water-conserving showerheads and handshowers deliver an impressive 35% water savings over traditional 2.75 gpm showerheads and handshowers. This is for an average family of four taking approximately seven-minute showers. In other words, you save over 7,700 gallons of water per year. Because part of the Kohler mission is to provide a singular level of quality across all our products, you can depend on KOHLER water-saving products to deliver outstanding performance and beautiful design. 3. Choose Faucets with Water-Saving AeratorsSmall in size, big on impact, KOHLER faucets with low-flow aerators deliver up to 45% water savings over traditional 2.75 gpm faucets.